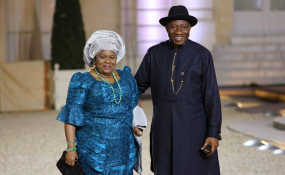 Patience Jonathan and Goodluck Jonathan. Mr Eze's statement described the news as fake, saying that it was a "calculated attempt to rubbish the elder statesman". "The PDP gave Jonathan the platform to serve as Deputy Governor, Governor, Vice President and eventually President of Nigeria. Jonathan has no reason at this time to resign his membership of the platform. "Those who derive pleasure in spreading fake information had better occupy themselves with more productive endeavours that are obviously more relevant to nation-building. "Obviously, this is a fabrication borne out of mischief as the publishers of the fake story claimed that the former President made the statement while being interviewed by the Nigeria News Agency (NNA). "There is absolutely no way the former President could have spoken to a non-existent news agency, as none in the country goes by that name," the statement stated.